Victor Llewellyn Page died on 14th January 2015, just a few weeks before his 89th birthday. Brought up a Methodist, Victor had been a member of Bromley Methodist Church for 55 years. He was a quiet unassuming man with a wonderful sense of humour. At meetings, if Victor spoke, you listened to his words of wisdom. It is often only at a person’s funeral that you hear of their life and works. Victor’s life should be shared, so what follows is a short biography of his life and the tributes paid to him. 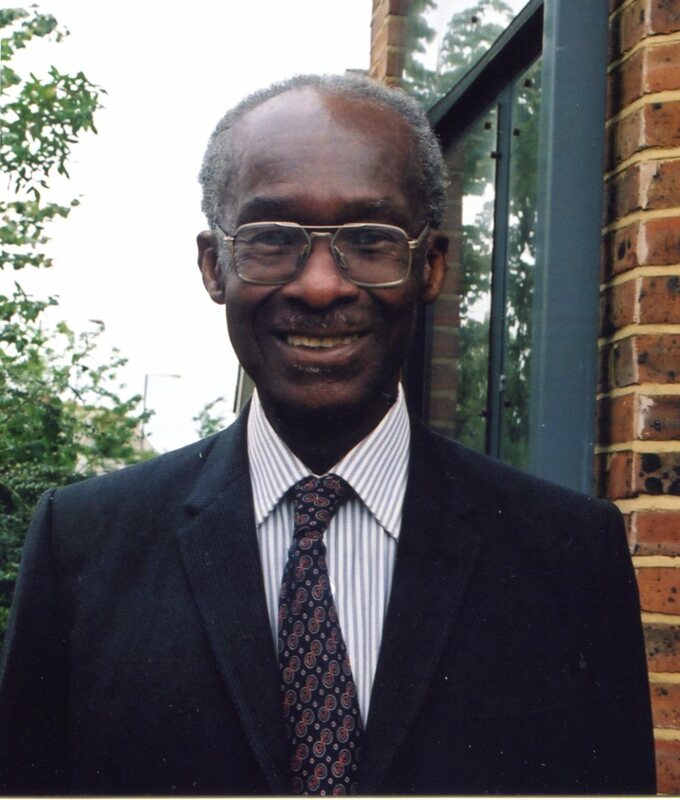 Victor Page was born in Manchester, Jamaica on 4th February 1926. He attended Frankfield Primary School (link) and continued contact with them throughout his life. After leaving school he became a civil servant. Victor sailed for England on the SS Jamaica Producer, arriving in London on 11th June 1951. His address is given as c/o Miss Thompson, Bethlem Royal Hospital, Beckenham. He was put in touch with Miss Porter, a Methodist, who provided essential support in those first few weeks and with whom he kept in contact for many years. The Colonial Office suggested that Victor apply to study dentistry, so he travelled to Scotland and enrolled at Glasgow University, starting his degree in October 1951. He struggled in his first year as he had not studied science at Higher Certificate but his determination helped him through. He joined the University Student International Club becoming its president in his 4th year. Whilst in Glasgow he met Evelyn. They moved to London and set up his dental practice where he worked for 40 years, retiring when he was 70. Victor and Evelyn had three children, Fiona, Renee and Adrian, and many grandchildren. Victor served as a magistrate from 1969 to 1996. He served both on the Main Bench and on the Family Panel, totalling in excess of 5000 hours of voluntary, unpaid, work. This was only one of Victor’s philanthropic endeavours. Victor had many interests, high amongst them was his support for the West Indies cricket team. His love of cricket led him to initiate a cricket programme at his old school, Frankfield Primary. He also loved gardening and travelling. Victor’s father and my mother’s father were brothers, so I have come to this service of thanksgiving for Victor’s life as family, to mourn the loss of an esteemed and well-loved member of our extended family- a prince among the Page Clan in Jamaica. I speak for Pearl, his beloved cousin with whom he had a special bond, and for first cousins Thelma Page and her brother Jackie Page and their families, for my own immediate family and the extended Page family in Jamaica and elsewhere, as well as the many scholars and associates whose lives have been positively impacted by Victor. I also speak on behalf of Victor’s dear friend, the Most Hon. P. J. Patterson, QC, former Prime Minister of Jamaica, who has asked me to deliver the following tribute. “Dr. Victor Page truly belongs to a generation whose numbers and membership may be dwindling, but whose contribution to the annals of human existence will withstand the passage of time. Born and reared in the southern plains of Manchester, the concepts of advancement through learning, the innate values of personal integrity, discipline and industry were inculcated from the very beginning. He excelled in the various fields of scholarship at the Primary and Secondary levels through a sound education which equipped him admirably for the studies he subsequently pursued in Scotland. He became a master in the practice of Dentistry, who won the admiration of his professional colleagues and patients alike. I met him during that period of my studies at the London School of Economics as a core member of that influential group of Caribbean activists in London, to which Lord David Pitt, Learie Constantine and High Commissioner Ivo Desouza belonged. They engaged in every activity which served to promote the Caribbean cause and could advance the welfare of its migrants in the cold, wintry climate and to confront discrimination of any form. He was black and he was proud. Victor Page made it evident, that no matter the field of endeavour, people of colour could compete with the very best and should not in any respect be regarded as inferior. He enjoyed the finest which life had to offer, because he worked hard to earn it. For him, it was first class all the way. Although he never returned to practise in his homeland, Jamaica remained at the forefront of his every step. His pioneering work and leadership of the Bustamante Foundation set the template for those who followed in his huge footsteps. He gave seriously of his time and money to a myriad of Charities and other deserving activities in Jamaica and the United Kingdom without ever seeking acknowledgement for his generosity. In the most intense argument, or discussion, he often brought a disarming touch of humour. He was a source of constant support and encouragement to me in the performance of my public duties. I have lost a friend and a worthy colleague in the search to build that society where race, gender, social class and political differences are totally subordinated so that the dignity of our common humanity can remain the prevailing focus. At this time of bereavement, we thank Evelyn, his wife and life-long partner, his devoted children, Fiona, Renee and Adrian, for permitting Victor to share so much of his tremendous energy and infectious joie de vivre with those who were privileged to know him during his earthly sojourn. Hallmarks of the Page family are: a strong Christian faith, an emphasis on education, strong family bonds and service to others. Victor’s life was a testimony to all of these. Although he had made the United Kingdom his home after his studies in dentistry at the University of Glasgow, it seemed that Jamaica always beckoned. Over the years, he would make periodic trips to Jamaica, almost always with his beloved Evelyn and sometimes with the children, when they were young. In later years, Victor and Evelyn would arrive in Jamaica, usually in March and sometimes in November. Often, their visits coincided with important events in my own family and in which they would participate: e.g the graduation of our youngest daughter from University and the christening of my granddaughter a few years ago. Invariably, (sometimes with a protesting Evelyn in tow, as well as my late mother and/or her sister Pearl and other family members) he would head for his village – walking the lands and surrounding areas which he had roamed as a child, tending to the graves of his parents and other long lost relatives, connecting with childhood friends, like Wilton Solomon quoted above, and reminiscing about childhood days and, of course, discussing politics. It was as if some impulse in the deepest part of his being propelled him periodically to reconnect with his roots, with his ancestral lands and with the memories that reside there. His signal contribution to Jamaica has come through the Bustamante Foundation – a registered charity in the UK which he founded in honour of the late Sir Alexander Bustamante who, in 1962, became the first Prime Minister of independent Jamaica. Sir Alexander and his wife Lady Gladys Bustamante were close personal friends of the Pages, and Victor established the Foundation to raise funds for Scholarships and Bursaries in the name of Sir Alexander who Victor admired for his tremendous contribution to the uplifting of the Jamaican working class. To fund the Bustamante awards, Victor single-handedly and with dogged determination, raised large sums of money here in England from organisations and individual benefactors (some with historical connections to the sugar industry in Jamaica). Administered through a local Bustamante Scholarship Committee -of which I became a member, at Victor’s insistence – the Foundation has, since 1970, awarded scholarships and bursaries to well over 100 hundred Jamaican students mainly in the fields of medicine and dentistry. On one of his trips to Jamaica, Victor was delighted to meet several of these scholars and to hear how they had progressed in their careers. Happily, most have remained in Jamaica and are contributing significantly to the development of the health care system- especially the public health system. Members of the Bustamante Scholarship Committee have asked me to extend their deepest sympathies to Evelyn and the rest of the family. They have asked me to express deep gratitude and appreciation of Victor’s vision and his passion and commitment to the development of Jamaica through the provision of financial support for education. On a person note, I am grateful for his many acts of kindness to me during my time in the UK in the 1970s qualifying for the Bar and for the interest and hospitality shown to me by both Victor and Evelyn over the years during my many trips to the England in connection with my doctoral programme. Victor’s philanthropy and dedication to education also found expression in the help which he gave, to his primary school – Frankfield Primary School in the parish of Manchester. He did this quietly and without fanfare- because that was his style. He outfitted this small rural school with computers and a printer. He financed the refurbishing of the cricket pitch at the School and provided cricket gears for the students who, I have been advised, have been doing exceptionally well in recent cricket tournaments. He was a man of class, integrity, dignity and humility who, through his professional work, his children and philanthropic endeavours, has left a rich legacy – the effects of which will be felt for generations to come. To act justly and to love mercy and to walk humbly with your God”. I believe that Victor tried to live as the Lord requires. In Jamaica, especially in rural parts, a person who takes leave of someone to begin a journey may be told “Walk Good” – a way of expressing good wishes for a safe trip, for journeying mercies. As we take leave of our beloved Victor, as his soul steps into eternity, I say on behalf of the Page clan in Jamaica, his dear friends and those whose lives he helped to transform through the provision of educational opportunities, “Walk good Victor, Walk Good, Beloved” May your soul find eternal peace and may the light of heaven shine on you always. We tend to develop such feeling of animosity for death when our loved ones pass away. This is because we are emotionally torn with grief that seems to take perpetual habitation in our hearts; but as we turn our sorrowful eyes to the word of God “it is appointed unto man once to die” we are satisfied that the Lord has done what seems Him good. On behalf of The Frankfield Primary and Infant School’s family we share with the Pages and their extended families our deepest feeling of sorrow on the passing of our dear Dr. Victor Page. We thank God for lending him to us for these years. We acknowledge that his purpose here on earth is accomplished. ‘Service to others’ epitomizes Dr. Victor Page. Here is a life that demanded notice; a life that exemplified strategic thinking; a life that encompassed generosity and loyalty. His was a life that inspired emulation, a life that burned so that the paths of others were lit. The path of the Frankfield family was certainly brightened by him. Sorrow fills our hearts – a sorrow that is deep and personal especially for me the principal. You see, our lives will be empty in the areas that he has brightened for us, as he was an active and valuable Past Student. His substantial gifts and support will be etched in our minds for years to come. How do we as beneficiaries generally, and specifically at Frankfield Primary and Infant school find permanent ways to memorialize him? We do so by thinking of the positive contributions and impact he has made to the lives of the students and more so the boys at our school. Purchase a Risograph that serves for general mass copying purposes and copying that aids testing of students. We are truly grateful. It was Albert Einstein who said “The value of a man should be seen in what he gives and not what he is able to receive” Dr. Victor Page gave generously of himself. He has left a legacy at our school that is unmatched. We hope that his great soul will find eternal rest in the heavenly court where comfort, joy and happiness abide. His precious memories, kind thoughts and consideration for others will always linger in our hearts at Frankfield. Prepared by: Marcia Lewis- Brown, Principal – Frankfield Primary & Infant with contributions from the Board of Management, staff, students and parents. Victor served as a Magistrate from 1969 until 1996, a total of nigh on 27 years. He served both on the Main Bench and on the Family Panel – the latter being work which is especially demanding in terms of time and emotional energy. One can add to the hours spent there the time spent in training and regularly re-training. Although I am not able to discover just how much time Victor gave altogether, as a conservative estimate, my guess would be something in excess of 5,000 hours. 5,000 hours of voluntary service, unpaid, largely unacknowledged and often barely thanked. Calm; Balanced; A much loved Member; Highly respected; Supportive of people; Common Sense; Always humane; Compassionate; A Good listener; Diffident; Thoughtful; Firm; A man with no enemies; A true Gentleman. And without exception, all of the ladies I asked said… Charming! What a list. What a Magistrate. What a man. Having done this exercise I fell to asking myself – how does a chap reach such perfection? What made him tick? I suspect that many of you know better than I, but perhaps the answer is all about us here, in this place, and in his Faith. Ezekiel was a Jew who lived in exile in Babylon. He was a man of deep faith and great imagination. When God first called him to be a prophet God gave him a scroll containing His, that is God’s, words which he was commanded to eat. He did so, and scripture records that it tasted as sweet as honey. Years before him Jeremiah had a similar experience of eating God’s words and Christians everywhere remember Christ at Holy Communion in a ritual that echoes such events. I suppose today we would call it a process of internalisation. Whatever, it seems to me, that Victor had, in a similar way, accepted his faith to such a degree, internalised if you prefer, that he lived it every day. And we, in the Magistracy and those beyond the Magistracy in the wider community, greatly benefited from his sense of justice, his wisdom and his deeply reflective nature. I am sure that Victor would have said, as the Psalmist said many years before him ‘Your commandments are my eternal possession; they are the joy of my heart. Victor, thank you and bless you. I never had a chance to meet my beloved cousin who I fondly called Uncle Victor. I had an extremely close relationship with his brother Aston who was for me not just a cousin but Uncle Aston. I’m truly blessed to be a member of this clan- special in too many ways to mention.